COMPETITIONS Sonoma bartenders sign up before the Shake Off at Stout Brothers in Santa Rosa, CA. Whole Lotta Shakin’ S onoma County is perhaps better known for its som- meliers than its bartenders. 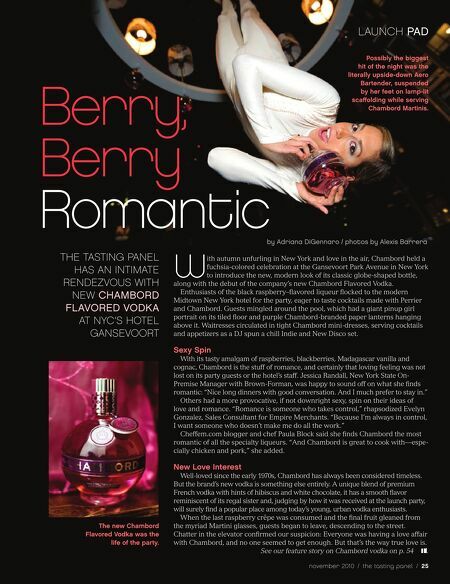 Lara Guerra and the United States Bartenders Guild (USBG), how- ever, might just change that. “We’re trying to raise awareness for the bartenders in Sonoma County,” says Guerra, who recently organized the “One Bourbon, One Scotch & One Beer Cocktail Shake Off” at Santa Rosa, CA–based Stout Brothers. 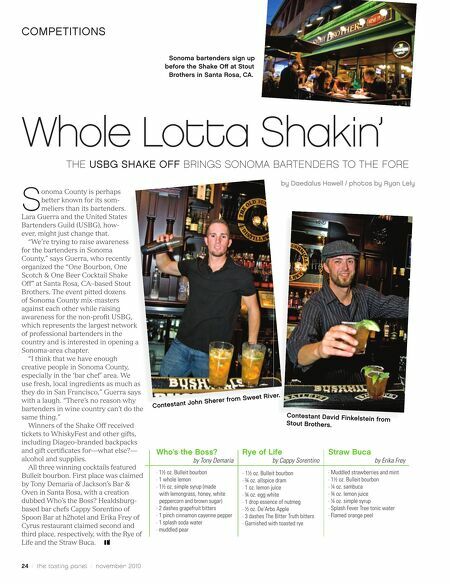 The event pitted dozens of Sonoma County mix-masters against each other while raising awareness for the non-profi t USBG, which represents the largest network of professional bartenders in the country and is interested in opening a Sonoma-area chapter. “I think that we have enough creative people in Sonoma County, especially in the ‘bar chef’ area. We use fresh, local ingredients as much as they do in San Francisco,” Guerra says with a laugh. “There’s no reason why bartenders in wine country can’t do the same thing.” Winners of the Shake Off received tickets to WhiskyFest and other gifts, including Diageo-branded backpacks and gift certifi cates for—what else?— alcohol and supplies. All three winning cocktails featured Bulleit bourbon. First place was claimed by Tony Demaria of Jackson’s Bar & Oven in Santa Rosa, with a creation dubbed Who’s the Boss? Healdsburg- based bar chefs Cappy Sorentino of Spoon Bar at h2hotel and Erika Frey of Cyrus restaurant claimed second and third place, respectively, with the Rye of Life and the Straw Buca. 2 / the tasting panel / november 2010 THE USBG SHAKE OFF BRINGS SONOMA BARTENDERS TO THE FORE by Daedalus Howell / photos by Ryan Lely Contestant David Finkelstein from Stout Brothers. Who’s the Boss? by Tony Demaria · 1½ oz. Bulleit bourbon · 1 whole lemon · 1½ oz. simple syrup (made with lemongrass, honey, white peppercorn and brown sugar) · 2 dashes grapefruit bitters · 1 pinch cinnamon cayenne pepper · 1 splash soda water · muddled pear Rye of Life by Cappy Sorentino · 1½ oz. Bulleit bourbon · ¾ oz. allspice dram · 1 oz. lemon juice · ¾ oz. egg white · 1 drop essence of nutmeg · ½ oz. De’Arbo Apple · 3 dashes The Bitter Truth bitters · Garnished with toasted rye Straw Buca by Erika Frey · Muddled strawberries and mint · 1½ oz. Bulleit bourbon · ¼ oz. sambuca · ¾ oz. lemon juice · ¼ oz. simple syrup · Splash Fever Tree tonic water · Flamed orange peel Contestant John Sherer from Sweet River. Up Front Who Is Donn Lux?